Series S - Air/Water/Chemical Delivery applications. The Series S reel is economical, lighter weight and easy to handle. Its technical design and materials meet the demands of a medium-duty industrial grade reel for continuous, trouble-free operation. Made of corrosion proof, tough polypropylene, extensive tests have shown it to be highly resistant to the vast majority of acids, alkalis and UV rays. 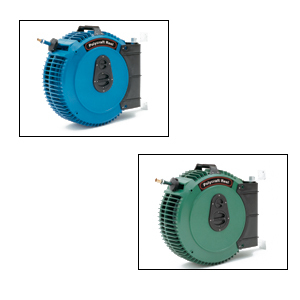 The Series S design protects the hose and allows easy cleaning of both hose and reel. Wall or floor mount. Complete with hose. FOB Shipping Point. Product No. Hose Lgt. I.D. P.S.I. Overall W x H x L Hose End Fitting Color Wt. (lbs.) Price Ea. W x H x L Hose I.D. Hose Length P.S.I. Wt. (lbs.) Price Ea.